Sid Meier’s Civilization is not the first thing that comes to mind when one thinks Warhammer 40,000. The universe where there is only war seems a less than intuitive match to a genre that involves trade, societal, and cultural endeavours, but turns out Space Marines fit pretty nicely into Firaxis’ classic structure. 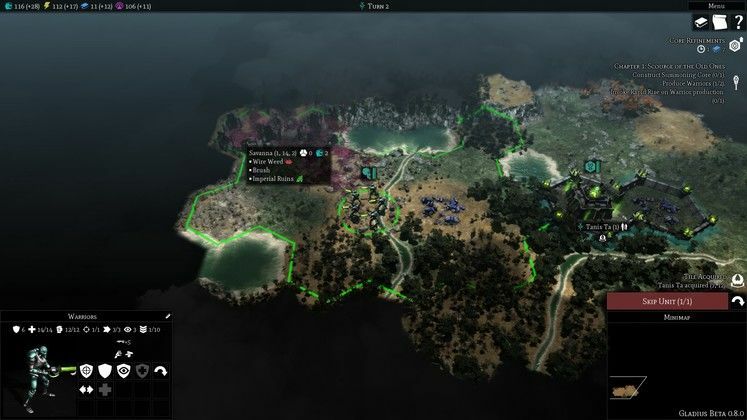 Last week, Slitherine flew five of the world’s top strategy game journalists to Milan, Italy, where we were given a preview of the publisher’s latest games. 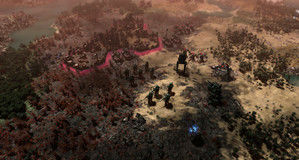 Amongst them was the much anticipated Warhammer 40,000: Gladius - Relics of War, a 4X strategy title in the molds of Civilization V and VI. Taking place in the original world of Gladius Prime, the game sees four races of the 40K universe battle for control of the planet. The Space Marines, the Imperial Guard, the Orks, and the Necrons all face each other in a massive free for all that can only end with one winner – forget the promise of progress and understanding, for in the grim dark future there is only war. There’s no diplomacy, culture, or trading in Gladius, as the focus of the game is all about combat. Each faction is unique in more ways than just the roster, with research trees, unit abilities, and even expansion strategies that differ from each other. While the Astra Militarum can settle just about anywhere and found multiple cities, for example, the Space Marines can only deploy a single fortress from orbit. Unlike Civ, cities in Gladius need to expand physically in order to erect more buildings. 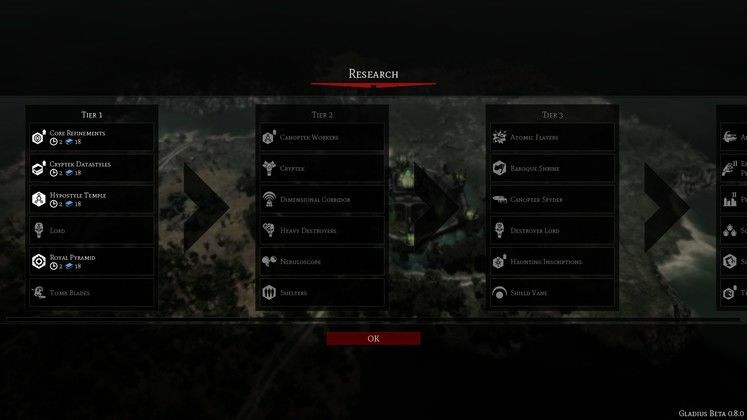 You select tiles around the central spire and mark them for expansion, aggregating its building slots and resources to your settlement. 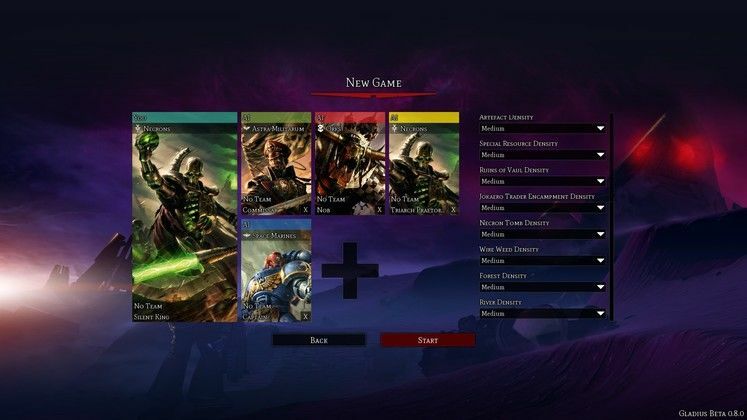 The game smartly adds different queues for each type of unit, allowing you to recruit more units, construct more vehicles, call in more heroes, and upgrade your infrastructure all at the same time. Weirdly, the physical expansion is disconnected from the city’s capabilities themselves. The main building tile is only able to fire at targets two or three hexes away, leading to awkward situations where a massive settlement with dozens of hexes enclosed by walls present zero challenge to an enemy if undefended. Until the enemy gets close enough to be shot by the ludicrous short range (and low powered) weapons of the main tile, they can simply stroll through the city and its borders as if they were grassland, fortifications be damned. Units are quite interestingly varied, and you can find pretty much every miniature type here – from Necrons whom regenerate to Tactical Marines that can’t be broken, they’re all here. 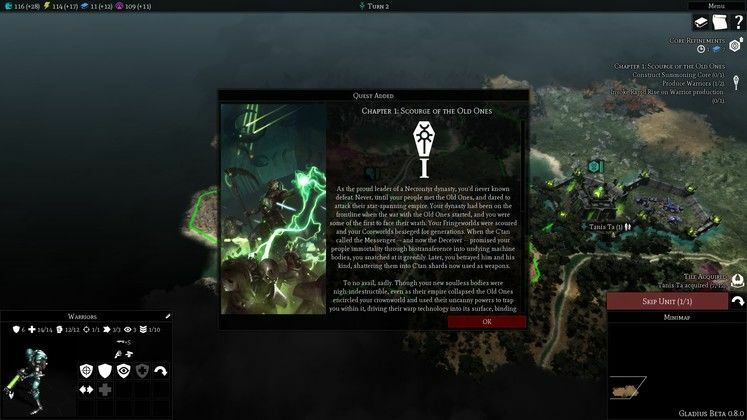 Unfortunately, Adeptus Astartes’ units do not appear on the map by dropping from the sky, instead just popping into existence like every other faction in the game. It’s a bit disappointing, and a missed opportunity to bring the tactical aspect of Space Marines doctrine into life. Like its tabletop origins, each unit occupies a spot on the map and must rely on its own stats, abilities, and flanking support to achieve victory. Range and movement must be kept in mind when manoeuvring, and morale also plays a large role, debuffing units who are shaken or broken and buffing those who retain cohesion. 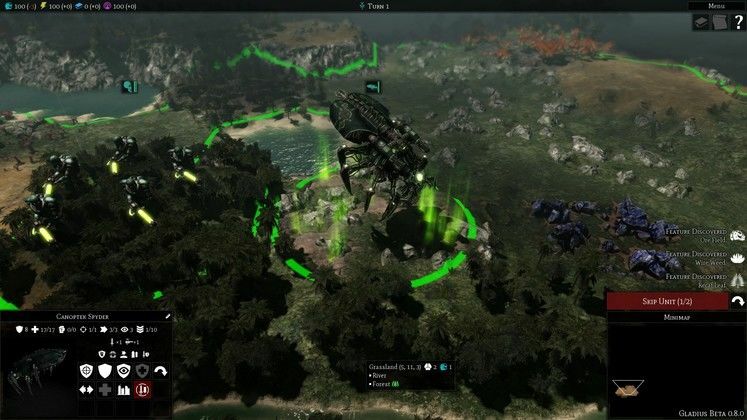 Even though units often have around three movement points, I could only move them a single hex for the vast majority of my turns – some sort of game balance coupled with a very steep terrain movement cost slowed exploration and tactical deployment to a crawl for most of my playthroughs, regardless of which race I was playing as. 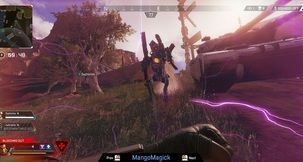 In engagements, Gladius uses a peculiar system where units which have not moved are able to counter-strike when attacked, which theoretically should be tactical but actually comes off as unreliable and a little unfair. Attacking an enemy often leads to your squad suffering retaliatory casualties, followed by a turn where the enemy attacks you with impunity. Those situations happen way too often thanks to the limited line of sight of most units, and it often stroked me as extremely out of character how a group of Space Marines would repeatedly stand motionless and watch as their battle brothers were slaughtered by enemies. That was one of two aspects that left a sour taste in my mouth regarding Gladius, the other being just how squishy units are. The game is faithful to 40K’s fluff, populating Gladius Prime with Psychneuien, Kroot Hounds, and the like everywhere, but they’re unbelievably strong. One pack of Kroot Hounds can go toe to toe with a Necron Warrior squad, and due to their ubiquity, often spell the death for your units. 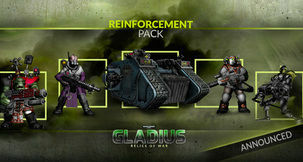 I appreciate the concerns of game balance, but it bothers me that Gladius thinks a group of immortal, self-repairing, gauss flayer-wielding robots could be so easily bested by wildlife. 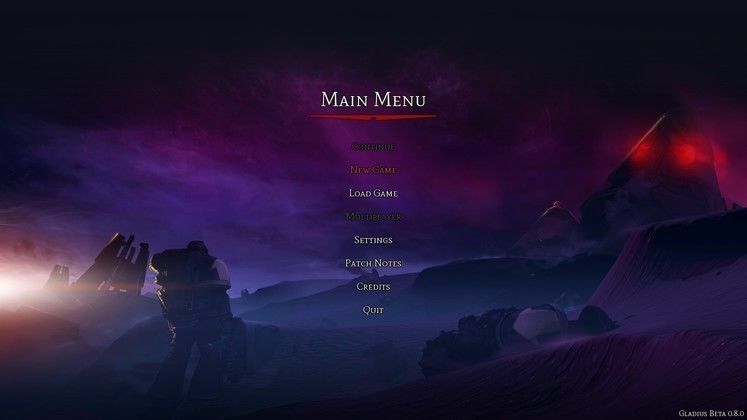 The game is technically sound and looks quite pretty, with a functional UI that makes everything but city production easy to get to. 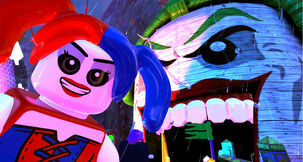 The planet, though barren and bleak, is full of geographical features, oceans, and lore-specific tiles like Jokero trade encampments and Promethium relay pipes that effectively break up the monotony of a ground landscape, and units look wonderfully faithful to their source material. Graphics and music are both good by today’s standards, and battles light up with glorious intensity when they occur – performance is not demanding, and it should run fine even in laptops and average computers. 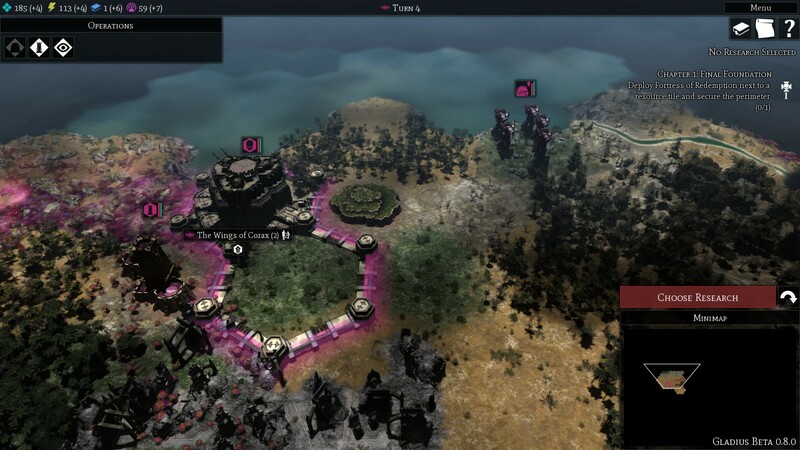 At the moment, I am quite torn with Gladius - Relics of War. On one hand, it has an obvious enthusiasm for the universe and some very good ideas when differentiating the factions. 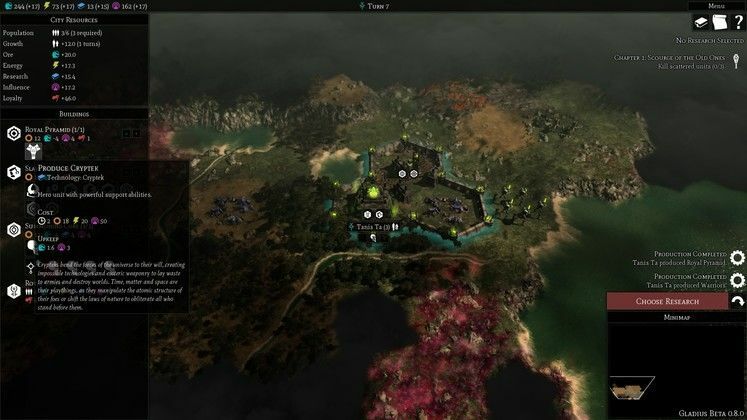 It respects the unique attributes of units and heroes, and even changes the name of difficulty levels to fit a specific culture, such as calling Normal/Hard as Commissar, Captain, Nob, or Immortal, depending on which faction you play as. On the other hand, it’s not as engaging as I had hoped, and it does lack or weirdly executes some pretty basic features. Units with queued movements do so at the start of a turn instead of at the end, doing away with decades of experience in the 4X genre that specifically evolved to not preventing change of mind in a kind of game where circumstances constantly and invariably change. The planet itself looks as bleak and lifeless as Civilization: Beyond Earth’s did, and there is no feedback on deployment of drop pods or battles, where even a simple screen shake as drop pods land would make a world of difference and make the game feel alive. 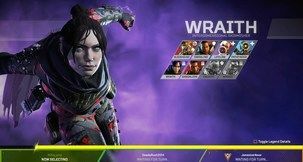 However, it’s the flaws with the combat system that worry me the most – the core of Gladius gameplay is combat, and that is just not engaging enough at present. Unit movement is too limited, balance too brutal, and units themselves too fragile to make it memorable – there is no personal investment to make you care for your troops during long play sessions, which severely reduces that “one more turn” feeling that makes Civilization (and XCOM, for that matter) such a resounding success. One major contributor to that feeling might be the cookie cutter feel of individual factions. Customisation simply amounts to a dozen shades of team colours, similar to Age of Empires three decades ago. The ability to customise your own chapter marines’ colours – something Dawn of War already did 20 years ago – or give life to your own Ork horde/IG contingent/Necron dynasty would add an insurmountable amount of personal investment in the game, and Gladius lost a gigantic opportunity by not adding that functionality in. 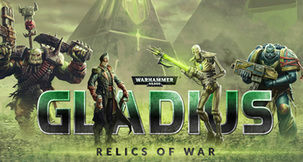 In the end, Warhammer 40,000: Gladius - Relics of War is a capable game, and with a month and a half to go till its May 17th release, it has enough time to address most of its shortcomings. 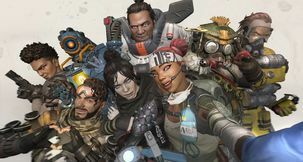 As the first 4X title in the 40K franchise, it carries a lot of fan expectations on its shoulders – and in order to deliver, it needs to get right a lot more than just the endless conflict.